In the months since Avengers: Infinity War was first released, it seems to have spawned a limitless variety of questions, interpretations, paeans, and imprecations. While these analyses range from myriad angles out of every nook and cranny of fandom, the most by far certainly focus on supervillain Thanos and the snap of his gauntleted fingers that wipes out half the galaxy’s population. “The madman,” Chesterton asserts, “is not the man who has lost his reason. The madman is the man who has lost everything except his reason.”While doubtless one of the Marvel Cinematic Universe’s stronger bad guys, the Thanos of the film has been critiqued in some circles for apparent inconsistencies in his character. It is probably futile to attempt to take a fictional alien foe and make him “realistic.” Nonetheless, I believe Thanos is a more coherent and compelling (if not sympathetic) character than some of his detractors make him out to be. Moreover, I believe that a fuller understanding of his motivations not only answers a few objections in one little corner of the geek universe; it also provides a matrix for better understanding his role in the films and the dangers he represents, as well as the virtues in the Avengers who have fought him and will (we assume) finally defeat him. By dismissing Lady Death and keeping the focus on Thanos’s relationship with established characters—and with Gamora in particular—the Infinity War team certainly did create a more “grounded” character—though Feige is not wrong to concede that the Mad Titan is still mad. When I analyzed his character in its Guardians of the Galaxy manifestation, I understandably used nihilism as a lens to interpret him. This made sense at the time, especially given that in his brief appearances he was associated with the film’s primary villain Ronan, another foe bent on effecting massive destruction. But the more developed version of Thanos—Feige’s “natural, grounded way”—portrays him in a way that is more humane, if ultimately no less malevolent. 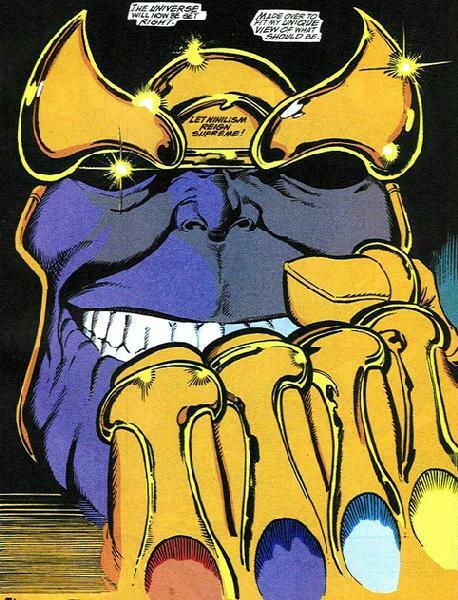 Individual lives, or life itself, scarcely factor into the consideration of Starlin’s Thanos. He is a powerful yet rather insecure would-be god whose goal is a weird Platonic destructiveness, a futile attempt to impress his morbid Petrarchan woman. Nothing like compassion or empathy ever seems to enter his mind. The horror and the pathos of the Russos’ Thanos occurs precisely because he does, in some manner, possess these qualities. He seeks to purge the universe of half its population believing the other half will live better lives as a result. One could contend that the humanitarianism he asserts for himself is false, a feigned cover-up for an underlying desire of conquest. But the movie’s creators don’t seem to have regarded him this way, and he is ultimately far more compelling a character if we take him at face value. Simply put, Thanos truly believes in the virtue of his cause. Every one who has had the misfortune to talk with people in the heart or on the edge of mental disorder, knows that their most sinister quality is a horrible clarity of detail; a connecting of one thing with another in a map more elaborate than a maze. If you argue with a madman, it is extremely probable that you will get the worst of it; for in many ways his mind moves all the quicker for not being delayed by the things that go with good judgment. He is not hampered by a sense of humour or by charity, or by the dumb certainties of experience. He is the more logical for losing certain sane affections. Thanos has a ready answer for every objection to his scheme. He certainly lacks any significant sense of humor, insisting that “fun isn’t something one considers when balancing the universe”—because he truly considers his task both a logical and a sacred one. Well, he was told “no” to an idea that he had that he felt was the only solution, and then was proved right to himself when that solution was not acted upon. . . . So his messianic complex—he is now committed to following through on the idea he had many many years ago. He is not a stable—although he appears stable at times, he is not a stable individual. The circular reasoning Russo describes here is characteristic of the maniac, whose mind, according to Chesterton “moves in a perfect but narrow circle. A small circle is quite as infinite as a large circle; but, though it is quite as infinite, it is not so large.” He doesn’t create more resources because he has already internally confirmed to himself that such solutions are irrelevant. Moreover, Thanos’s sacrifice of Gamora in the Soul Stone sequence makes more sense if we think of Thanos as trapped in the rigid circularity of his own madness. Everyone’s lives consist of attempting to create a hierarchy of the loves that compete for our limited time and attention, what in Augustine’s thought is often called the ordo amoris. Sacrifice comes from giving up one love for the sake of a greater love. Thanos thinks of himself as truly loving Gamora, and perhaps he does, but because his maniacal quest for the godlike power to execute his plan is preeminent, he must sacrifice her to this quest. He would rather not see her die—but because in his own mind he must bear the burden of solving the universe’s horrific problem, he must end her life (and countless others) for the betterment of those who survive. This ghastly rationale is absurdly flawed, as almost anyone outside Thanos’s head can recognize. Some who serve him might be true believers, but many, one presumes, do his bidding from more selfish motives, whether a desire for power or a plain fear of incurring his wrath. But few, one expects, truly share his mania. And, of course, the Avengers and Marvel’s other heroes lead the charge against him. Mysticism keeps men sane. As long as you have mystery you have health; when you destroy mystery you create morbidity. The ordinary man has always been sane because the ordinary man has always been a mystic. He has permitted the twilight. He has always had one foot in earth and the other in fairyland. This is why the Avengers aren’t drawn in to Thanos’s madness and, indeed, actively seek to combat it, just as many extraordinarily ordinary folks fight rational maniacs in Chesterton’s fiction. So perhaps we should not be surprised that the one who has apparently devised the final plan for defeating Thanos is among the most flawed, and the most mystic, of them all: Doctor Strange. The origins of Doctor Strange all point (eventually) to his status as Chestertonian sane mystic. At first, he is anything but, a mind-bogglingly arrogant physician whose ego is matched only by his significant intellect and surgical skill. But an accident takes those skills away from him, and his subsequent experiences cause him to doubt the efficacy of his materialistic rationalism. So he becomes far more “ordinary” in this regard, humbled by his failures into acknowledging the non-rational dimensions of existence, pursuing a mysterious mysticism. 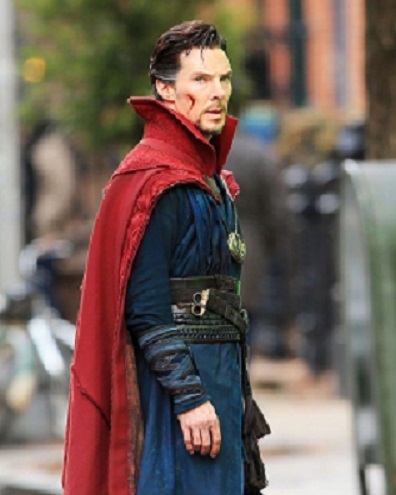 Such an understanding of his character becomes even more compelling when we add the factor that the film Doctor Strange was directed and co-written by Scott Derrickson, who considers Chesterton his favorite author and has identified Orthodoxy as “the seminal book of ideas in my life.” In the movie, Stephen Strange’s tutor, the Ancient One, opens his mind to move from skepticism to “possibility.” This openness to possibility is what marks Chesterton’s sane mystic everyman, and it is what allows Strange to search through myriad timelines to identify the single outcome that Marvel fans expect will lead to Thanos’s downfall. Infinity War is actually a strange movie for Christians to appreciate. It presents a scenario that is entirely at odds with Christian eschatological assurance. No being could truly threaten reality in the way Thanos does, for no being could ever come close to matching the majesty of the Christian God. Indeed, the closest any entity ever came was the Devil’s rebellion, and he squirms in the final throes of defeat. But the character of Thanos is instructive because he is impossible. Chesterton’s maniac is pitiful, for he creates a reality that is an infinite but small circle. What Chesterton never asks, but what the Russos explore, is the question of what the universe might look like if such a maniac actually obtained godlike powers. The pathos of the sad madman is replaced by the horror of a being with infinite power but limited scope, a being whose insanity cannot allow his wisdom to expand with his power and who contracts the cosmos to his limitations. As K. B. Hoyle has noted elsewhere at Christ and Pop Culture, Thanos plays out as “a bastardized reverse echo” of the Christian conception of God. Thanos sacrifices his unwilling child to achieve godlike power so that he can annihilate life; the true God, in the person of the willing Son, forgoes the power of godhead “as a ransom for many,” for he is “not willing that any should perish.” As Chesterton notes, the God of the Bible is supremely free to work how he desires; Thanos’s own desires constrict him, and with him the whole universe. Yes, Thanos the Mad Titan is a maniac. But his madness shows us the true grace of being a sane mystic who can embrace uncertainty. It reminds how grateful we can be that the One who actually holds supreme power seeks only our good in his cosmic order. “How much larger your life would be if your self could become smaller in it,” Chesterton declares of his maniacs. It is a lesson that Thanos, and we too, would do well to heed.